This is a small but energetic dog who loves people and other animals. The rare lowchen is an energetic and affectionate dog. The lowchen is a small dog often referred to as a “little lion” for its name and grooming cut — which leaves the front mane grown but the hindquarters shaved or closely clipped. The tail usually has a plume on the end and the fur on the paws can appear like little boots. The breed is small but muscular and said to be fearless. These dogs average in height from 12 to 14 inches and can range in weight from under 10 pounds to almost 20 pounds. They live an average of 10 to 14 years, but some have been known to live as long as 17 years or longer. The lowchen is considered a rare breed that once faced extinction. The dogs have long, wavy fur that is soft and comes in all colors. They do not shed much and are considered great dogs for allergy sufferers. The name lowchen means “little lion” in German, which is thought to be the breed’s origin over 400 years ago. The breed was popular in Europe, often sleeping in master bedrooms, where their close-trimmed hindquarters were used as feet warmers. The origin has been debated, with some claiming the dog came from the Mediterranean or Russia. The breed appeared in paintings as early as the 1400s. The breed almost went extinct but was revived by a Belgian breeder. The American Kennel Club (AKC) recognized the breed in 1996. The lowchen is a companion pet. The breed also competes in conformation, obedience and agility trials. Lowchen are happy, sociable, energetic dogs that love the company of other animals and their owners. They are good with other pets, even non-canine animals, and are affectionate. They are intelligent and noted to be easily trainable. Lowchen need a daily walk, and they also play inside to expel energy. These small dogs are great for apartment and city life with regular outings. Lowchen need to be thoroughly brushed twice per week and will need regular grooming sessions to maintain the lion cut (if desired). While the lion cut is required for conformation shows, some people choose a short puppy cut instead. Bathing can be done once per week or once per month, depending on necessity. Thoroughly brush the coat and clear and mats or tangles before washing. Lowchen are said to be good dogs for people with allergies. Clip the dog’s nails regularly, brush the teeth and clean the ears. The Lowchen is a healthy breed of dog. They do still require regular heartworm, parasite and vaccination protection, and they are at risk for cataracts, patella luxation and progressive renal atrophy. Is the Lowchen the Right Dog for You? The lowchen is a small dog big on personality. They are active indoors and out, and they do well in apartments or city living with regular outings. They don’t shed much and are said to be great for allergy sufferers, but the coat will require weekly maintenance. 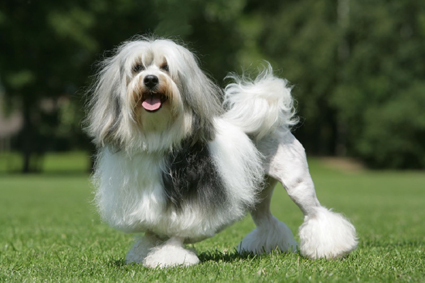 If you go with the lion cut, be prepared for trips to the groomer to keep it maintained. This breed loves other pets and people, and it would be a fun and affectionate addition to your family. If you consider getting a lowchen, please check rescues and adoption resources. Even purebred animals can end up in shelters. Try out Petful’s adoptable pet search. Because the lowchen is a rare breed, you may not find one through adoption resources. You can also check with rescue groups and breeders. If you do choose to go to a breeder, make sure the breeder is reputable and doesn’t exhibit any of the puppy mill warning signs.